We like to use infra red lights to keep our Yorkies warm. Puppies especially do well with this kind of heat, but it is always important to place the lamp in such a way that they can easily move away from the direct heat to their own comfort zone. These bulbs are usually available at your local hardware store, but you may have to search for a suitable lamp that can handle the heat from the bulb. Mature dogs handle the cold better than puppies can, but a sudden climate change can be tough on them too. While most Yorkshire Terrier owners will obviously keep their dogs inside, especially in cold weather, Yorkies still enjoy an outing and it is good for their health too. When walking your dog outside in cold weather, you and your dog can both end up sick. To build up heat, energy needs to be expended. A quick run is much better than going for a regular walk as you would do in the summer time. This is very good to keep your Yorkie healthy and fit, even during winter. You do not have to put booties on their feet when you go outside, just check that their paws are clean from foreign objects after the outing. Unlike us, dogs have a special technique to stop their cold feet and legs from getting colder and that stops the cold from spreading to their whole bodies. So stop worrying about going for a quick run in the cold weather. Expending energy to keep warm requires more food, but be ware! While dogs kept out of doors do well on a larger diet, indoor dogs tend to be lazier in cold weather and may develop an unhealthy weight problem. Be careful to never overfeed your indoor dog just because you feel he needs more food in winter, you may be killing him with your kindness. Rather check with your vet before feeding your Yorkie anything extra for the winter. Traditionally Yorkies are dressed up, so why not do it properly for winter. 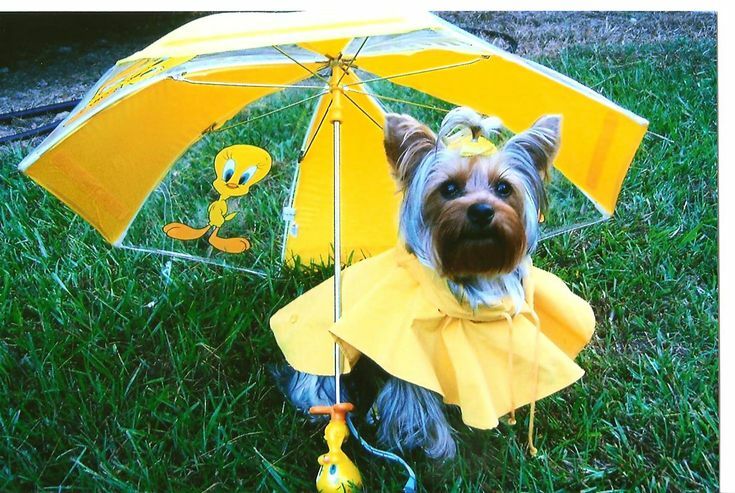 If you plan on going out in the rain, make sure you have suitable rain gear for your little friend. A wet porous jersey can be worse for your Yorkie than if he was able to quickly shake the water off. NB! Please note that for many Yorkies with fine hair, wearing clothes means you have to be a lot more diligent about brushing out knots! Remember not to trim your Yorkie's hair too short before winter. Although they only have a single coat unlike most other dogs, it still helps them to keep warm. Remember where they come from! Yorkshire Terriers originated in Yorkshire, and Yorkshire in England has a climate, to say the least.. that is very Cold! With reasonable care, you and your Yorkie can have a trouble free and enjoyable winter! For more hints on how to deal with the cold weather see the SPCA's suggestions.